The Conaito VoIP EVO SDK contains a high performance VoIP conferencing client capable of delivering crystal clear sound even for both low and high-bandwidth users. VoIP EVO users are arranged in a tree-structure where each node is a room/channel where users can talk, send instant messages and share files. More than 40 users can be in each room/channel and participate in a conference while resource usage, both memory-wise and CPU-wise, is still kept at an acceptable level for gaming and other types of resource intensive tasks. Having the above features available makes it simple to develop any type of VoIP-enabled application, like e.g. a teaching tool, live support, chat, meeting tool, a multiplayer game or any other type of application which requires users being able to talk, type messages and send files to each other. 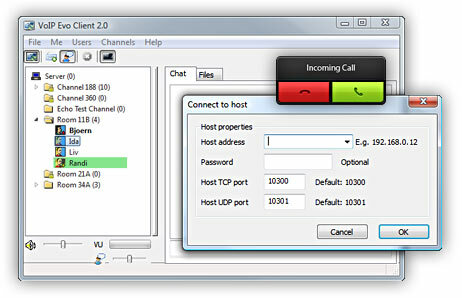 For Conaito VoIP EVO clients to be able to interact with each other they must connect to a Conaito VoIP EVO server which keeps track of where users are located and forwards voice-data packets between clients. The VoIP EVO server can be hosted in both LAN and internet environments. The licensed VoIP EVO SDK is available in both an encrypted (Enterprise Secure Edition) and an unencrypted (Enterprise Edition) version. For most applications the unencrypted (Enterprise Edition) version provides enough security in the way that a server and the channels on a server can be password-protected so unauthorized users are denied access. If, however, it is also important that the data being transmitted between clients and the server then it is necessary to use the encrypted (Enterprise Secure Edition) version of the SDK which uses TLS and BlowFish encryption. The API exposed by the VoIP clients and VoIP EVO Server in both the encrypted (Enterprise Secure Edition) and unencrypted (Enterprise Edition) SDK are exactly the same. Please, don't hesitate trying our VoIP EVO SDK at once and get yourself, as well as your customers, the exciting experience of easy, fast and high quality standard applications which VoIP-enable your application. We hope you enjoy the Conaito VoIP EVO SDK – A simple way to VoIP-enable your applications.